Every time the heart muscles contract, blood is ejected from the ventricles and a pulse of pressure is transmitted through the circulatory system. When this pulse is travelling through the vessels, it causes vessel`s wall displacement, which is measurable at various points on the peripheral circulatory system. The pulse can be felt by placing finger tip over the radial artery in the wrist or some other location of the body. The pulse pressure and waveform indicates the blood pressure and flow. 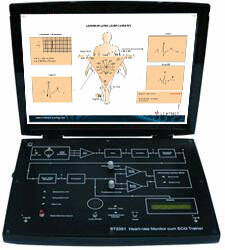 Instrument used to detect the arterial pulse and pulse pressure waveform in the extremities are called Plethysmograph. 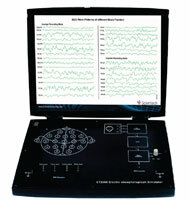 The pulse gives a measure of pulse wave velocity and can be recorded and compared with the ECG signal. The pulse wave travels at 5 to 15m/s, depending on the size and rigidity of the arterial wall. Larger and more rigid the artery wall, greater is the velocity. 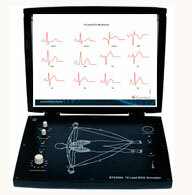 Scientech-2357, Heart Rate Measurement (Transmission Method) is an ideal platform to enhance education, training, skills & development amongs our young minds. 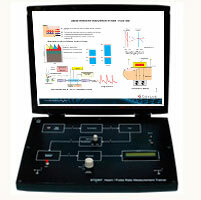 Study of basic amplification of bio signal through instrumentation amplifier. 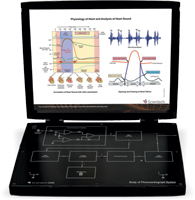 Study of basic transmission method (optical) for pulse analysis. 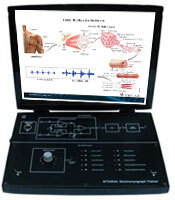 Study of real time heart rate monitoring using optical sensor.